With 60 easy and flavorful recipes that focus on high fats, low carbs, and lean proteins, the editors of Good Housekeeping help dieters jump-start their keto eating plan. Keto has become the diet of choice for losing weight--and it's also winning over converts who want to eat better and live healthier. Followers claim the popular high-fat, low-carb eating plan has helped them quickly shed pounds, while also boosting energy and relieving other ailments such as inflammation. But the diet's aim of inducing ketosis--a metabolic process where your body burns fat instead of carbs for energy--can leave dieters feeling like they're faced with restrictive meal options and difficult, overwhelming guidelines. Good Housekeeping solves the problem with 60 keto-approved, appetizing recipes made with healthy fats, delicious low-carb vegetables and fruits, and lean proteins. 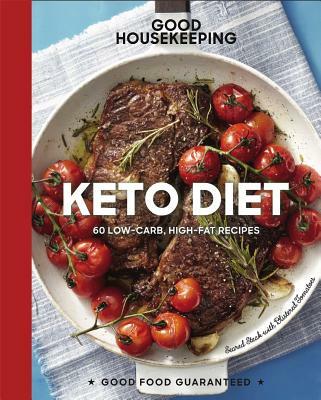 With a primer on how to kick-start your ketogenic eating, and tips and tricks throughout from the Good Housekeeping Test Kitchen, this book will become your essential reference for integrating a popular and successful diet into your lifestyle. Good Housekeeping is a leading lifestyle media brand inspiring a monthly audience of 30+ million readers to discover genius innovations, delicious ideas, style-savvy trends, compelling news, and best-in-class products for their homes, families, and themselves. The Good Housekeeping Institute's state-of-the-art labs combined with Good Housekeeping's seasoned editorial talent and renowned test kitchen is unparalleled. In addition to its US flagship, Good Housekeeping publishes five editions around the world. Susan Westmoreland is Culinary Director of Good Housekeeping. She lives in Brooklyn, NY.